Video banking is an emerging channel where financial institutions like banks, credit unions, and building societies can engage their customers or members in face-to-face transactions through remote video collaboration sessions. This report’s objectives are to provide an overview of video banking trends, insights and recommendations to financial services organizations that want to explore the video banking opportunity. An omnibus survey of 4,144 consumers run through Kantar TNS in the US, Great Britain, France, and Germany. An online survey of 288 financial services professionals in 43 countries who we re invited to respond by Efma, CUNA Strategic Services, and Vidyo. Similar surveys were conducted in 2016 and 2017 and allow a historical comparison. 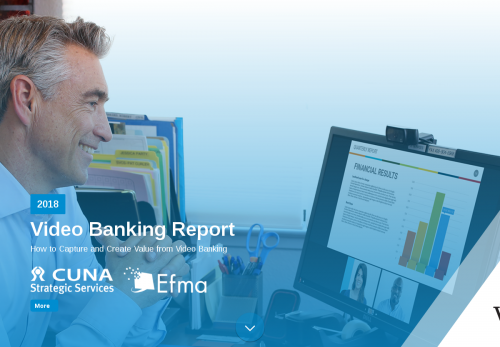 The report also provides analyses based on Vidyo’s experience in implementing video banking services for organizations of all sizes across the globe. Customers/members join a video session using a personal device (computer, tablet, smartphone) over the internet from anywhere. Customers/members join a video session on a branch kiosk or dedicated office to speak with a remote staff member.